To many this release marked the beginning of the smartphone era; the onset of handheld computing that has undeniably changed the manner in which humans interact with both each other and the environment around them. However, the Apple iPhone was not the first commercially released smartphone, in fact, the development of technology like this had been in the works for nearly three decades. Wireless telephony made its debut in the United States in 1946, although all of these early devices were tethered to cars. Finally, in 1973, Motorola released the very first handheld mobile phone weighing in at an impressive 2.5 pounds. Almost immediately, designers and scientists began exploring the possibilities of developing handheld computers capable of receiving and sending data over a wireless communication network. Unfortunately, the telecommunications infrastructure and micro-processing power needed for devices like these was simply not available at the time. With the introduction of 2G (second generation) cellular networks in the early 1990s, companies began experimenting with data reliant functions for cellular phones. IBM arguably released the world’s first true smartphone in 1993. 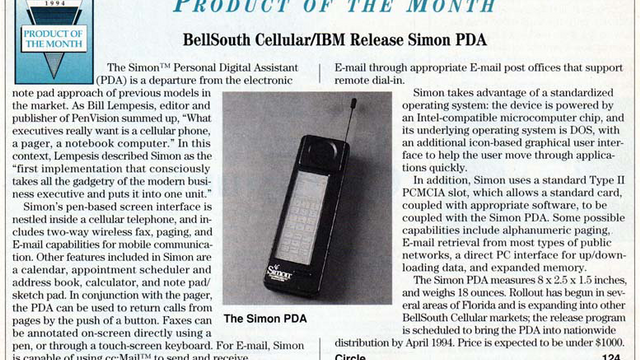 Nicknamed, Simon, this phone featured a keyboard, stylus and touch screen. The device could send faxes, check email, and run programs like a word processor and spreadsheet creator. The one thing that it could not do was connect to a web browser. The first commercial phone capable of this feat was the Nokia 9000 Communicator, released three years later in 1996. The marginal successes of these earliest smartphones demonstrated an increasing market for data enabled devices and the race to develop more powerful and cheaper smartphones had begun in earnest. The development of more powerful phones made a giant leap forward following the launch of the first 3G Mobile Broadband network throughout the Tokyo metropolitan area in 2001. One of the biggest differences between earlier 2G and the new 3G networks was the latter’s ability to stream media such as radio and television, a function that quickly made smartphones a truly marketable product. Between 2001 and 2007 companies like Palm, HTC, BlackBerry, Samsung, Nokia, and Motorola, all released numerous smartphones, experimenting with all varieties of shapes, sizes, and configurations. In the end however, it would be the design of Apple’s first generation iPhone that would come to define what current smartphones look, feel, and act like. The game had changed and the percentage of Americans in possession of smartphones immediately began to rapidly increase. In 2010 only 35% of Americans owned smartphone devices but by 2017 over three-quarters of our adult population are connected to the internet through their mobile devices…including my 81 year old grandmother. I am sure that no science fiction writers saw that coming. Tim Roberts is a founding partner of Next Exit History and currently director of the Lincoln and Fort Stanton historic sites for the state of New Mexico, Department of Cultural Affairs.